At Carter's, we want your memories to last a life time. Designed to track the first five years of your baby's development, this cute memory book with a blue nautical theme and all kinds of sweet ocean animals is the perfect place to record all of the special moments with your little one. This book includes themed pages like "Our Family Tree," "Photos of my Family," and "Growth Charts," and has a photo window on the front for extra personalization. Includes (1) Carter's Blue Nautical My First Years Bound Memory Book that measures 9" W x 11.125" H and contains 60 themed pages. Includes (1) Carter's Blue Nautical My First Years Bound Memory Book for Baby Boys. Measures 9'' W x 11.125'' H and contains 60 themed pages. 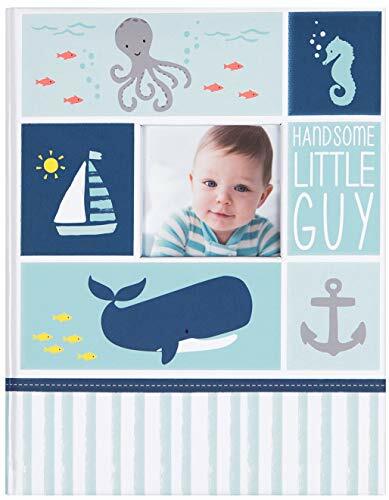 With a blue nautical theme and all kinds of cute ocean animals, our bound baby album memory book is a wonderful way to track the first five years of your baby boy's development. The photo frame window on the front cover allows you to turn this book into a personalized keepsake. This colorful, cute bound baby book makes a thoughtful gift for baby showers or mothers expecting a little boy.